Ann from Little Red Bus proposed to support the action of Lydia from Ever Ours and the ladies from Utterly Engaged. They are holding a day of silence for Japan tomorrow March 18 ( = no blog post ) and support the organisation ShelterBox which was amongst the first to be on site after the quake and tsunami hit north-east Japan last Friday. Anyone that has a blog can help out with this one. The aim is just raise awareness and respect and acknowledge the devastation going on in Japan. You all can check out what I did for mine here or Utterly Engaged's here and do it your way if you'd like. Whatever anyone can contribute will be appreciated. Every little helps. 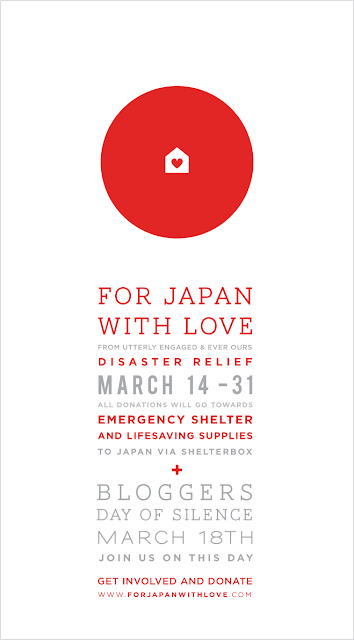 Please do participate tomorrow and donate to ShelterBox via For JapanwithLove. Oh, Japan is so close to my heart! I have lived in Tokyo and I missed it so much for a long time... feeling a strong connection to its people and culture. This one is a good way to help, and I will donate to the Red Cross too. Je vais allumer une bougie ce vendredi à la mémoire des disparus et pour illuminer le futur des rescapés. Merci Marie, je vais faire partie du mouvement et donner, bien sur! Je vais prier et agir comme je peux, donner et encourager les gens à donner.